Mercy’s last few months have been the hardest of her life. Her mother tried to kill her on the night of her graduation, and now someone is following her. Every sound, every shadow, every movement makes her feel unsafe, even in her own home. As she tries to convince herself it’s all her imagination, the handsome and enigmatic Caleb Blackwell stepped out of the shadows and tells her the truth about her past . . . and her identity. 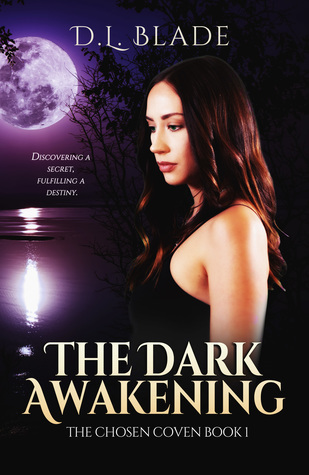 Caleb not only tells her that she once belonged to him, but that she's part of a centuries-old coven of witches whose sole purpose for existence is to seek out and destroy a supernatural force which threatens mankind. About the Author: D.L. Blade grew up in southern California, but relocated to Colorado with her family in 2014. She always loved writing, concentrating on poetry rather than prose when she was younger. That changed however, when she had a dream one night and decided to create a story about it. In her spare time, D.L. enjoys a wide variety of hobbies, including reading, attending rock concerts and volunteering at local animal shelters where she can indulge in her passion for all forms of life. In the future, D.L. hopes that she can continue to write exciting novels that will captivate her readers and bring them into the worlds that she creates using her imagination. My Review: Here is another indie title that worked out well. Man if you wished that October and Halloween could be every month then check out this one! Its witches, werewolves, and vampires, oh my! I think that a few tv companies need to find this one because it was just that good!! The writing was new and fresh and the story was one that didn't feel like others of its kind. I loved the MC Mercy and her situation of trying to figure out why her mom tried to kill her and graduating high school. It was one great journey that I won't soon forget and I will have to get the next book when it comes out! !